This is my second one of these fitted to a C90. The first one lasted nearly five years and only failed recently when I had to store the bike for the last 12 months. Now back on the road, charged straight out of the box.A great battery which works well and great service from Tayner. As described. Good price. Arrived quickly and was well packed. Fitted to John Deere lawnmower si time will tell on reliability, but so far so good. Works well on my clients classic motor bike so I give it five star rating. The real test is its longevity. As my old bikes do not get used regularly the batteries do not last well despite regular charges. Very pleased it's a very good value and quality battery , and it arrived in only two days. Thank you very much. excellent value, and prompt delivery. very satisfied. Marvellous. It arrived within 24-hours of ordering and was charged and ready to go. No messing about with acid and a charger. I popped it into my Vespa and off we went. 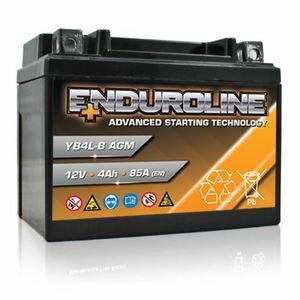 I'm delighted with the service, the price and the product and now buying fill-your-own batteries are harder to buy due to new restrictions, this is a perfect and affordable alternative. Bought as a back up for my Lithium ion battery. Good value for money. Good product, good price too. This is my 3rd purchase, great product, excellent next day delivery at very competitive prices. Battery failed within 12 months but probably due to poor maintenance as it was left idle for most of this time. Fitted to grandsons garden buggy which rarely comes out.